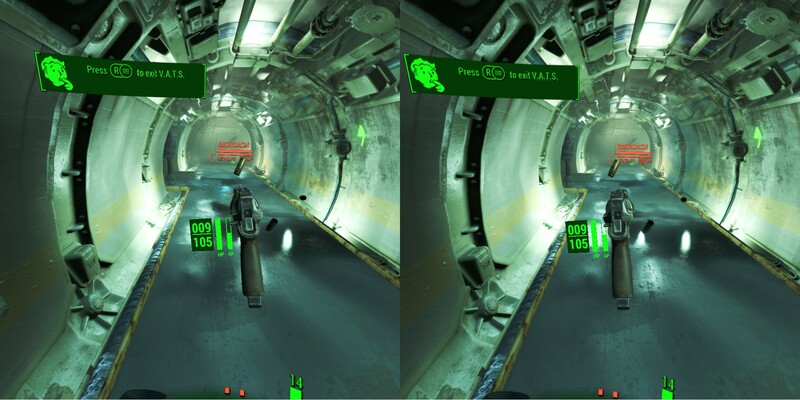 One of the biggest issues with VR gaming is the lack of substantive experiences. The relatively small user-base for VR makes it difficult for developers to justify spending huge chunks of money on large-scale, purpose-built VR games. As such the vast majority of VR experiences last only a handful of hours. That being said, there are plenty of regular, non-VR games that have been adapted to use the technology, and one of the largest is Fallout 4. Bethesda has spent the last few years porting much of its back-catalogue over to VR, albeit with mixed results. Doom VFR, which was a purpose-built VR version of 2016’s Doom, is a pretty fantastic game. On the other hand, Skyrim VR is a much rougher port, impressive for the scope it offers but not much else. 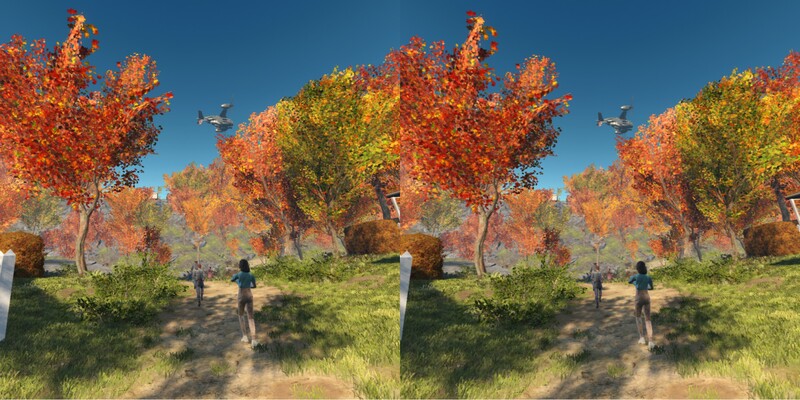 Fallout 4 VR sits somewhere in the middle of these two projects. Bethesda has obviously learned from its troubled experiences adapting Skyrim to VR, while some of Fallout 4’s inherent systems make it more naturally suited to playing with a VR headset. That being said, it’s still not an ideal experience, and you are going to have to put up with some limitations and frustrations if you want to play Fallout 4 in VR. One area where Fallout 4 immediately benefits over Skyrim is in its world design. Skyrim may have dramatic mountain-scapes, but Fallout 4’s world is chunkier and much more colourful, an aesthetic that complements current VR hardware well. Particularly successful are the computer terminals that you can interact with throughout the game. These are displayed as an overlay on your screen, which, while somewhat immersion breaking, are nice and easy to read thanks to Fallout 4’s vivid green monitor displays. When it comes to moving around, Fallout 4 lets players traverse the world either via teleportation or more traditional fluid movement. The latter is the most seamless way to experience VR, but if you suffer from motion-sickness (like me) it quickly becomes unbearable. Teleporting is more fiddly, especially in combat, but once you’re familiar with the system it is an efficient alternative. My one issue with both movement approaches is that your characters gets exhausted far too quickly, which can make travelling from place to place something of a chore. The system is in place to stop you running rings around enemies, but the limited perspective of VR kind of acts as a brake on that anyway, so having the exhaustion on top of that simply becomes frustrating. 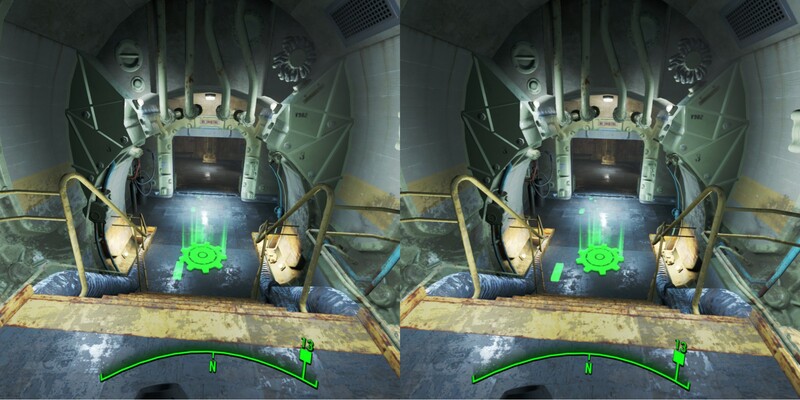 Arguably the most improved area of Fallout 4 in VR is combat. Fallout 4’s combat is primarily focussed on firearms (although you can play a melee build if you want to). When you equip a gun, it is immediately bound to your right touch controller, letting you manually aim and fire it with your hand. Using weapons in this way feels natural and satisfying, although you really do have to concentrate when aiming, otherwise you’ll find yourself missing a lot. Melee weapons like batons are also wielded manually, although since damage in Fallout 4 is dished out numerically, fighting hand-to-hand amounts to an awful lot of flailing about until you’ve upgraded your abilities in this area. As for interacting with the world more generally, Fallout 4’s approach is somewhat haphazard. 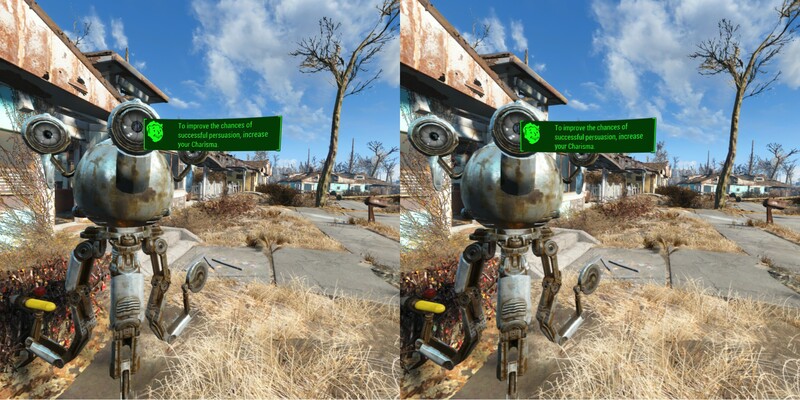 For dialogue sequences, Fallout 4 VR removes the cinematic camera angles, keeping you purely in first-person and binding your various dialogue options to the touch control buttons. Although this is technically removing a feature, it makes perfect sense. Seeing your character from multiple angles whenever you spoke to someone would be disorienting. On the flip side, one of the weakest aspects of the VR port is that your hands are only modelled when you’re using them to punch someone. Hence, interactions such as picking up items in the world amount to the object simply floating in front of your face. The same goes for your Pip-Boy, the inventory system that notionally clips around your forearm. Only, when you raise the Pip-Boy to use it, there is no forearm, which looks really bizarre. In fact, using the Pip-Boy is a surreal experience in general. You activate the Pip-Boy by raising your left arm to your face, which is a natural movement even if in-game it makes you feel like a ghost. When activated, the Pip-Boy doubles in size. Although this looks downright bizarre, it makes the Pip Boy much easier to read, and also means you don’t have to maintain holding your arm right up to your face. 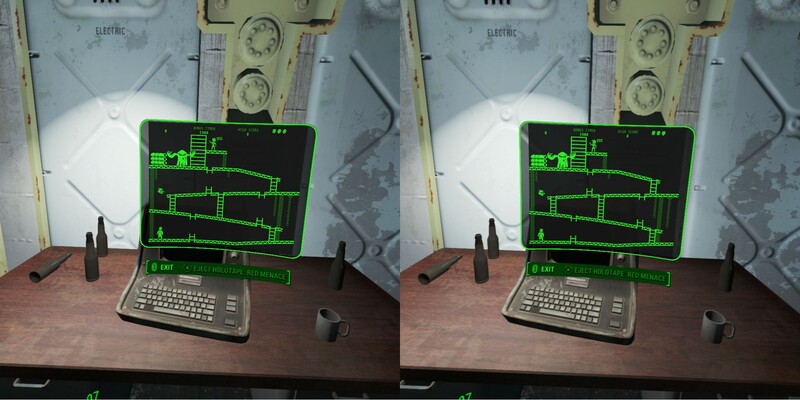 Unfortunately, the actual menu-system for the Pip-Boy hasn’t been changed at all, meaning it’s still a layer-cake of scrolling menus, all of which are manipulated using the controllers rather than virtual touch. 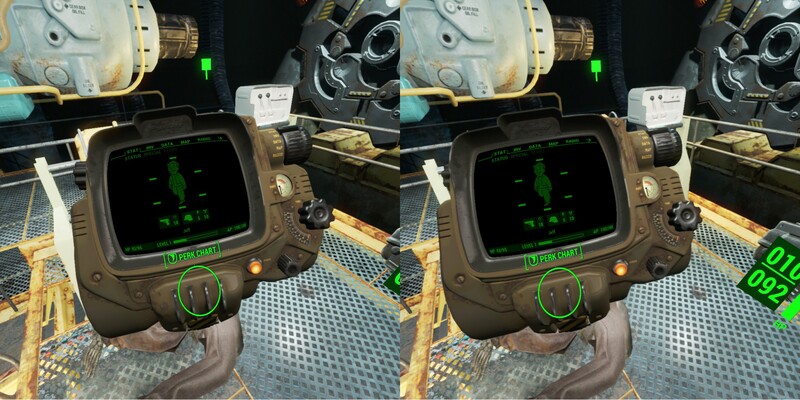 Bethesda has never been great at UI design, but trying to use the Pip-Boy in VR is particularly egregious. This goes double during combat, as Fallout 4 continues playing even when you’re using the Pip-Boy. If a fight breaks out while your navigating your inventory, you’re as good as dead. So where does Fallout 4 sit as a VR experience? If you’ve never played Fallout 4 before, then the sheer size of it means it’s got better value for money than most other VR games. However, going into it with no prior experience of Fallout 4 is going to be pretty bewildering. It’s also not a game you want to rush out and buy a VR headset specifically for. It’s too uneven in terms of how it utilises the hardware, and there are other games that, while smaller, are much better introductions to VR. That said, if you’re an experienced VR player hankering after something more substantial, then Fallout 4 is probably the best large-scale VR experience available. Investigating Fallout’s world and battling its mutant creatures is hugely gratifying once you get used to it. Moreover, for someone like me who was ambivalent about Fallout 4 on launch, the VR adds a new dimension to the experience that makes me want to explore the world all over again.